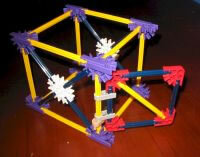 Classic K'NEX includes a special two-part hinge component, but it is not supplied in all K'NEX Sets. Hinges can also be bought separately as "clips" in our K'NEX shop. Simply click the two separate parts together to make the hinge. There are lots of ways of making hinges if you don't have the special hinge components. One of the simplest is to attach a clip with hole end to the end or to the edge of a rod, and then put another rod through the hole in the clip to create a hinge. Two of these type of hinges together can be used to make an effective door hinge (see photo).